In honor of spring, we feasted on a wonderfully green, satisfying meal of pearl barley risotto with zucchini, mushrooms and fresh basil and a side of roasted asparagus and ramps. 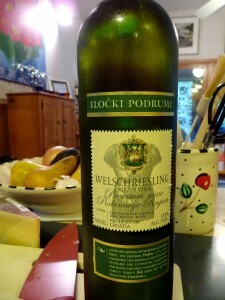 To match, I searched for the greenest thing in my wine collection, which turned out to be a 2009 Iločki Podrumi Welschriesling. 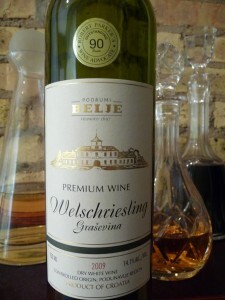 The Iločki Podrumi winery lies on the right bank of the Danube near Ilok, the easternmost town of Croatia. Romans manning the local fortress likely maintained vineyards here, and wine certainly factored into the economy by the time the 15th-century “Old Cellar” was built. Capable of aging up to a million liters of wine, the Old Cellar reached the pinnacle of its fame when it supplied approximately 11,000 bottles of wine to the coronation celebrations of Elizabeth II. 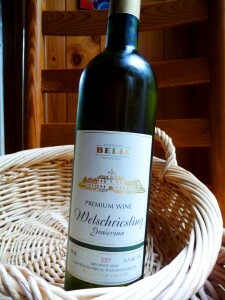 I recently wrote a post about the 2009 Belje Welschriesling, and my description of the wine concerned the distributor. He thought the bottle I tasted must have been corked. He provided another bottle for me to taste, and I discovered that he was quite right: The first bottle had indeed been tainted. In retrospect, I should perhaps have realized that notes of “aged cheddar” were not meant to appear in the nose.